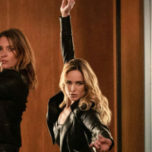 All of the anxious Avalance shippers can breathe a sigh of relief- Jes Macallan has been promoted to serious regular for the fourth season of Legends of Tomorrow! 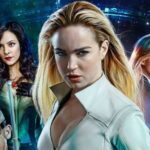 Entertainment Weekly reports that Macallan, who plays Time Bureau Director Ava Sharpe, has been moved up to the position of series regular for the show’s upcoming fourth season, which was just confirmed this week. Ava has also become a love interest for our fearless Waverider Captain, Sara Lance. The character has become a fan favorite, and the couple has been very popular throughout the fandom. The show also recently announced that Matt Ryan, playing the character Constantine in 3 episodes of Season 3, has also been promoted to a series regular. Things might be getting a little crowded on the Waverider, folks. This season has seen the addition of Tala Ashe and Keiynan Lonsdale to the Waverider’s crew, but also saw the exits of Victor Garber and Franz Drameh. 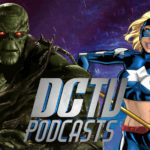 Sara and Ava’s relationship is still somewhat unclear since Sara broke things off at the end of episode 15, but we may get our answers in the season finale. The finale airs Monday, April 9th, at 8 pm ET! You’re not gonna want to miss it. 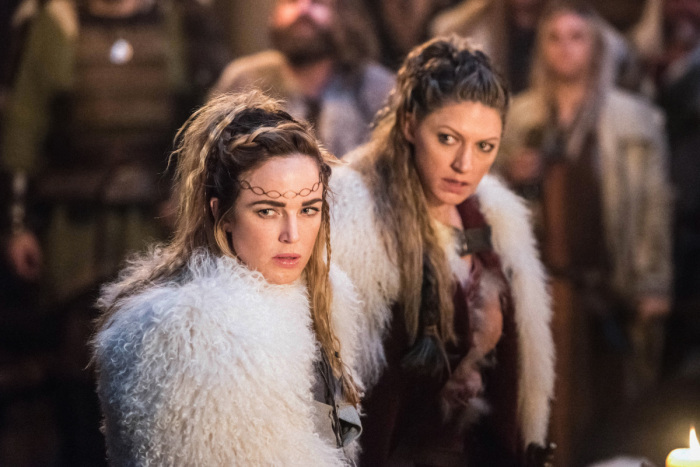 SEASON FINALE — The Legends plan to vanquish Mallus by using the totems doesn’t go as planned, forcing Rip (guest star Arthur Darvill) to improvise. The team finds itself regrouping in the Wild West where they run into their old pal Jonah Hex (guest star Johnathon Schaech). 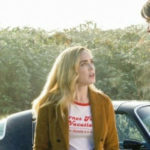 Sara (Caity Lotz) leaves Ray (Brandon Routh) in charge of watching Damien Darhk (Neal McDonaugh), while she comes up with a new plan. Meanwhile, Amaya (Maisie Richarson-Sellers) is determined to find a way to use the totems to destroy Mallus. Dominic Purcell, Tala Ashe, Keiynan Lonsdale, Nick Zano and Franz Drameh also star. Dermott Downs directed the episode written by Marc Guggenheim & Phil Klemmer (#318). Original airdate 4/9/2018.